Bellatrix, I'm a Pug! : Click it for a Trick Sit! So mom has decided I'm older now, so it's time to get serious about my training. When I just just a wee one, mom decided I wasn't "getting it" when it came to training. She just thought I needed to pay attention to her and not get distracted by the world in general....so she decided to give clicker training a chance. See mom used to work at an animal shelter and they used this device when training dogs that had ADD type behavior. It's really a cool device that "marks" the behavior she's looking for in me. I really like this clicker, it means every time I hear it, I get a treat. Mom says I learn all sorts of lessons very quickly, and I get them right quickly. I'm so happy with this method that I really work hard to show mom just how smart I am. I think all pugs, who have a hard time with training, should give this a try! You'll be showing mom just how brilliant you are in no time flat!! Hi Bellatrix! I love the new look of your bloggy. Very patriotic and just in time for summer. I'm way too old to learn any new tricks but I do love treats. Maybe Mom could just buy me a clicker and I could click it when I want a treat! Oh's Belly!! We's love 'dis post!! So...hee hee...We's kicked it under the cabinets when Daddy wasn't looking...HAHAHAHA! Mommy found it and put it up!! We are always telling Daddy he needs a clip board and a whistle 'cuz sometimes he be enforcing 'da boot camp tactics!! Now we's got 'dis to show him!!! Click it = TREATS!!!!!!!! So, a clicker is like a pug remote that dispenses food? Cool! I asked my human why I don't have one and she said she's not coordinated enough for clicking. You're so lucky to have a clicker and a click-friendly human. I'm glad you like the new site. Mom is so bad on the computer that it took her forever to change it...so I think it'll stay this way for a while! I totally think you can learn new tricks, maybe just tailor them for your age. Your mom can totally teach you how to nap, or support your pillow, or balance the sofa. Totally treat worthy. Hiya Gang! That's so funny that you guys tried to hide your clicker....I bet you wouldn't have done that if you knew it meant a treat was coming. The only hitch is that you actually have to do something to earn that click/treat. It's a bummer that being adorable doesn't count. I don't suggest peeing on his pillow, I think that might earn you a time out! Instead, orb him until he buckles and get your sweet rewards. Oh and my dad tried that boot camp technique on me too, man putting him in his place was easy. I just held up my paw and wrapped him around it...easy breezy. WOW!!! 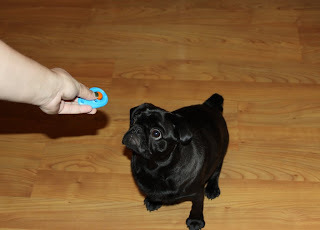 Really a wondeful pics of your pug.. he is so cute especially i like his ocean blue eyes.. this is good that you have make him to learn so many things.. great job keep it up..
Bellatrix, that's great your momma is using the clicker!! The momma has one somewhere, but we never really got into it. Maybe I should make her get it out again so we can work on things. It's never to late to learn and get a treat!! Sequoia does the clicker training, but Mom and Dad don't do it with little old me....Im so well behaved! Sequoia is such a little piggy sometimes I thinks the treats distract her. Anyways we are glad you are getting smarts and treats! We couldn't get the hang of the clicker & then Phoebe found it & chewed to bits. Who can blame her it smelled like treats. If we tried it again what sequence do you use for the clicker; Click-behavior-treat or behavior-click-treat? Congrats on the training! Hey Zoey and Phoebe! Once you know what the click means...ie click = treat then mom does the following. Tells me to "sit", I sit, she clicks then the treat comes. The clicker marks the desired behavior and lets me know the treat is coming. The click action is faster than our mommies hand and treat so it feels like we don't get our deserved reward. Now this is the hang up...once we know the command, then the click (and thus the treat) are no longer necessary, so mom moves onto the new/next behavior. I hate to go down...but with the clicker, I oblige. It's loads of fun! I am with you Pearl. I like to be a free bird and not be a "follower". Mom is all hyped up on trying the clicker training with me now. Thanks a lot Bellatrix! Apparently my sister Kitty used it when she was a pup and it worked very well.